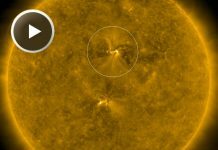 Sunspot AR2297 has been crackling with solar flares all week long. 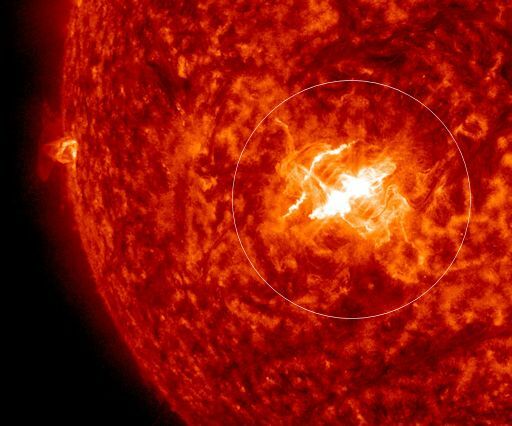 Today it has produced a really big one – X2-class flare – at 16:22 UT (09:22 PDT), which blackouted parts of the world! 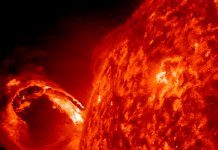 Extreme ultraviolet radiation from the explosion ionized the upper layers of Earth’s atmosphere, causing HF radio fade-outs and other propagation effects on the dayside of our planet. In the red zone of this map, ham radio operators and mariners may have noticed brief but complete blackout conditions at frequencies below 10 MHz. The disturbance has since subsided. 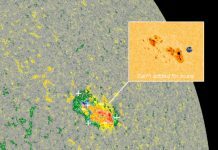 Natural radio emissions from the sun suggest that a CME is emerging from the blast site at speeds exceeding 1,400 km/s (3.1 million mph).